Building Lasting Change – no other theme could capture more perfectly the essence and character of the FutureLab 2018. It was challenging, thought-provoking, inspiring, but above all, it was an impact-driven event. This year, the annual oikos conference took place in Geneva, Switzerland from 26 to 27 of October. 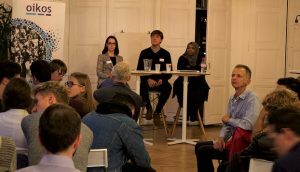 The FutureLab 2018 brought together over 100 oikos members, partners and supporters to discuss sustainability issues affecting our world and explore opportunities for the integration of sustainability into economics and management curricula. Sustainability was at the heart of the FutureLab logistics as well. From serving vegetarian and vegan food to encouraging participants to take trains or buses for travel, we tried to limit our carbon footprint as much as we could. Moreover, with the help of the Swiss climate protection organization -myclimate, which offset our emissions, the FutureLab 2018 became a climate neutral conference. The first day of the FutureLab conference focused on the topic of building change in the world. Speakers and participants explored current sustainability challenges and exchanged ideas on the role of business and individuals in creating a more just world. The attendees also participated in workshops to improve their understanding of topics as diverse as leadership, Sustainable Development Goals, carbon literacy, energy, globalization, and fashion. The keynote speaker, Graeme Maxton, an author and former Secretary General of the Club of Rome, talked about human activities that had grave consequences on our planet: “We have been emitting ever-increasing amount of CO2, and if we carry on doing that, then in about 15-20 years we will reach the level of CO2 in the atmosphere that would make the 2-degree increase in global average temperatures inevitable.” He argued that the chain reaction this process could set off would be impossible to halt. “Climate change is not actually the main problem, because it is a symptom. The problem is the human ecological footprint. We are the problem, and we have to be a part of the solution” – he explained. Maxton emphasized the need for immediate action: Climate change is happening at this very moment, and the only action that counts is the one people decide to take now. Individuals, politicians, and businesses alike need to invest their resources to render the radical change tangible. 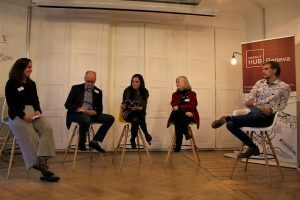 “If you look at business through the lenses of the climate change, it will profoundly change your perspectives” – asserted Mark Wade, an oikos Trustee and moderator of a panel that discussed the role of business in building a sustainable economy. The panel also featured two former oikos members representing two different business perspectives. Daniel Duarte, a co-founder of a sustainable start-up company – koawach, stressed the importance of new businesses, as pioneers that implement the most innovative, bold ideas and inspire established, big companies to adopt new modes of conduct. Pauline Sprenger from the Sustainability Department of Volkswagen Group, on the opposing side, talked about her corporation’s commitment to e-mobility and to changing the system. 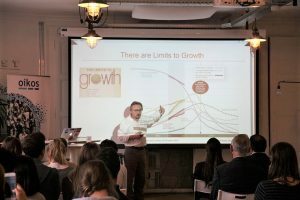 Thibault Mercier of Industriels de Genève explained that changes come progressively and by setting modest goals each time, the prevalence of sustainability in business practices could indeed become possible. The definite highlight of the day was the Stories of Building Change session, where oikos members and invited speakers shared their amazing memories of taking lead on bringing change in the world. “Somehow, I drafted a business proposal that helped create a shelter for orphan girls” – said Kathrin Zirn, an oikee from Reutlingen. “I convinced my boyfriend not to eat meat at home” – recalled Pauline Sprenger. They showed to the participants that change comes in different forms, but what matters is constant strive for it and noticing our impact in things that might seem trivial at the first glance. The most inspiring speech of the day came from Zamzam Ibrahim of the UK National Union of Students. “The hope for a better tomorrow is why I get out of bed in the morning” – she said. She shared the story of a young woman who defied all odds to have her say in shaping a better future and discussed how students could build a sustainable world. The next day shifted focus to the economics and management education and to the importance of embedding sustainability in the higher education system. What followed was an exuberant exchange of concerns and ideas for change. “Our conception of economics is so deeply flawed because of the way we teach economics” – noted Maeve Cohen, Director of Rethinking Economics in her opening speech. “Lack of diversity in economics has serious implications on the policies that we create” – she continued by pointing out flaws in the decision making process with regard to the idea of increasing productivity. “Why do we always cut funds for healthcare, social care and education (sectors that overwhelmingly employ women) and favor spendings on infrastructure (a sector that is male-dominated)?” – Cohen asked, and the answer was easy to find – because there are almost no women involved in shaping these policies. According to Jonas Haertle of the UN Institute for Training and Research (UNITAR), the main problem in economics education is that it is detached from practice. Two more things to take into consideration are how top journals select articles for publishing and the importance business school rankings place on the graduates’ income upon graduation. “Business schools have forgotten why they exist” – Haertle noted. Then, where do the solutions lie? Petra Molthan-Hill, a co-chair of the UN PRME Working Group on Climate Change and the Environment, suggested that integrating Sustainable Development Goals into management curriculum can be one effective response, so is qualifying students in carbon literacy and offering modules focused on personal and academic development. For Bastian Van der Linden of EDHEC Business School, it’s crucial to develop a program with students and forever forget the metaphor of a sponge, that sees students as mere “absorbers” of information. “Be humble and critical. Remain curious about what others think. Do not claim objectivity, but keep on searching for truth. Denormalize science!” – urged Stephan Panther, Vice-President for Teaching at Cusanus Hochschule. He also shared the experience of his school that tries to combine “university’s dedication to scholarship with the social relevance of applied science institutions”. The oikos community was there not only to learn about solutions that are already being implemented by faculty but to develop their own approaches and to bring forward innovative ideas. The participants delved into identifying patterns of how the majority of economists and managers present themselves and how the ultimate professionals in these fields should look like. They also tried to create a vision for their ideal economics and management curriculum that would enable this leap forward. In the following workshop sessions, participants learned how to campaign for curriculum change, what strategies and tools to adopt in order to reach the desired outcome. The participants also had a chance to discuss their curriculum proposals with a panel of deans comprised by Lorraine Eden, Professor of Management and Business at Texas A&M University, Maria Alejandra Gonzalez-Perez, Professor of Management at Universidad EAFIT, and Stephan Panther. They weighed in the proposals and helped define how to implement these ideas by 2020. As Clémentine Robert, the incoming president of oikos noted, the energy, motivation and ideas revitalized during the conference should create lasting impact. “Pass it on” – was the message she shared with a song created by oikos students and partners. The FutureLab 2018 reminded the participants that they are surrounded by like-minded people who want to create a better world and are ready to tackle all the challenges that will definitely come in the way. The speakers and participants, their enthusiasm and hope shaped the event and reaffirmed our belief that Building Lasting Change is indeed a possible endeavor. Visit the oikos flickr account to find yourself on our FutureLab 2018 pictures. Spend “30 seconds with the FutureLab Team“, and learn about people behind the event.